I'll be posting about AM2R progress in a couple of days. I think you should go to work at Nintendo and Work with them to make new Metroids. 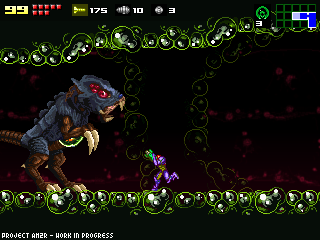 Both 2-D and 3-D Like Metroid for the NGC and like ones for GBA. I miss playing my favorite Metroid games on the NGC.. Please stay away from the Metroid 'Other M' I really didn't like that game. Anyways. Just saying. I like those games rather than the 'Other M' Crap they tried to pull off. I'm so glad your work is getting noticed, you deserve it. Amigo te felicito, tu proyecto AM2R lleva ya 5 años de trabajo y yo lo he estado siguiendo desde entonces. No me he perdido ninguna actualización del proyecto en tu blog. Me alegra saber que profesionales se interesan cada vez mas en tu proyecto y quien sabe, puede que Nintendo te pida trabajar para ellos. Te agradezco por dedicar tiempo a este proyecto y no defraudar a quienes esperan con ansias este gran proyecto finalizado. Me alegro por tu familia y mis felicidades para ti por tu hijita. Quizas no me recuerdas, pero solia utlilizar el nickname "Dark Master". Antiguamente lo utilizaba. That spoiler is looking pretty gorgeous. Glad I took the risk. Also, wow, five years? Man, you need to throw a party or something when the final version is finally out! Just commenting to let you know we're still around and eager. You have something great, and as months pass, it gets closer and closer to being a reality. We're watching and waiting patiently. Congratulations! Can't wait see how it turned out! Love the queen sprite and the new site! We are Happy to have you still working on the Project. Its you ability to grit one's teeth and work for so long (Years) on this Project. You work bears Fruit, we are Happy for you ! & of course we will be happy to Play that too. Queen lokks Great btw ! That Queen DOES indeed look menacing. I look forward to fighting her! That Underwater temple sounds fun, too. Al juego lo venderas? Osea deberemos pagar para poder jugarlo?? Doctor, te pasaste por nuevo. Epic!!! No puedo esparar! Dude your AWSOME. Now that the qween is done, how much longer untill finished??? Looks great. I'm really looking forward to it. Keep it up! Good luck! Just to let you know....yes we fans are still around! I still check this blog every two weeks and hold my breathe and just hope when I click on the link there is a new post and update. I can't even put in words how much I can't wait for the completed game! I will personally send you the $39 for it when it's complete as I would pay for a new metroid at the stores. Your work as shown in the blogs and demo are fantastic!!! The time it takes to do what you have done should not go unoticed, especially with family and work! Please keep continuing and finish what has been started, as it will be one fantastic accomplishment adorned by many!! Cheers and good luck! I've made am2r my start page, since that's really what i want to know every time i dial up the net. I'm sure i'm not the only one taking such measures. We, your fans, love what you're doing. I didn't think that you had been working on your project for so long. But the effort put into the game really shows off that fact. The tileset clashes pretty badly with her, though. I'm guessing its just a placeholder? hey doc, glad to see the updates. i'm glad to see that this project is almost done, and very happy to see that (at least some part of) nintendo approves. thanks for the countless hours of sleep you've missed, and all the dedication to this project. I think the release of this game should be celebrated with a lot of publicity, an album (like harmony of a hunter) containing the soundtrack to the game with maybe some guest music(Metroid Metal, maybe? ), a special video, and so on. Its too good to simply be released with a mere download link. Maybe to be released around metroid's next anniversary. Couple = two. So far, the progress update hasn't come in six and a half couple days. Don't leave us swinging in the wind, until November. Until November. Don't leave us swinging in the wiiiiiiind. The demo links were removed? Why's that? Looking great! Your game is one of the few games I'm eagerly waiting to play at the moment. Metroid 2 was one of the first games I ever owned. Can't wait to play a fresh take on one of my favorite games of all time. Really good interview with some probing questions and intelligent answers - well done! The links are still there. Near the top of the page, below the picture, are two links saying "AM2R Demo" and "Metroid: Confrontation"
Read this in the magazine and it led me to your site. Such an exciting project, it's amazing that there are such dedicated fans that make the gaming community better for all of us. Hope everything is going well for you and I look forward to the projects outcome. The site is firmly in my favourites bar! Reading the spoilers definitely got me excited for the final release. It's been such a long time since I've played a new, 2D Metroid/Mega Man game. I'm really hopeful for this project to fill that void. Keep up the good work! Doc,plz make a new demo and dont cancel!!!!! I would explode if this was the last of am2r!!!!! You need to stop doing interviews. You're going to get C&D'd.